Take a trip to see the largest entertainment and shopping destination in the world. Dubai's luxurious waterfront development is a purpose-built canal city with parks, promenades, impressive properties and shopping complexes. The world's tallest building is a phenomenal feat of engineering and home to luxurious apartments, offices and a top-class hotel. 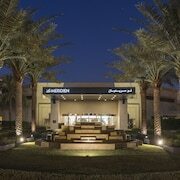 Within walking distance from Dubai mall. 20-30’ walk. Hotel map could be more detailed. Distance and directions to downtown. 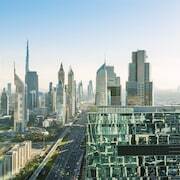 Families will find kid-friendly activities in Dubai, and visitors give high marks for the shopping, beaches, and top-notch restaurants. This city also attracts tourists with its cafés and architecture. Top sights in the city include Dubai Mall, Burj Khalifa, and Mall of the Emirates. The city's cultural venues include Dubai Museum and The Dubai Heritage Village. Families come for attractions such as Aquaventure, Wild Wadi Water Park, and IMG Worlds of Adventure. The city is notable for landmarks like Burj Khalifa, Jumeirah Mosque, and Grand Mosque. 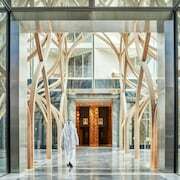 One&Only The Palm - Guests who stay at this 5-star hotel in Palm Jumeirah can enjoy access to a full-service spa and a private beach, along with free WiFi. It's a favorite with Expedia travelers for its pool and helpful staff. 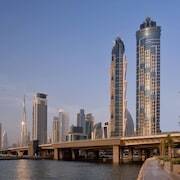 Renaissance Downtown Hotel, Dubai - Our customers like the helpful staff at this hotel. With a stay at this hotel in Beach & Coast, guests can enjoy access to a full-service spa and 5 restaurants, along with pillowtop beds. Al Maha, A Luxury Collection Desert Resort & Spa, Dubai - With a stay at this 5-star hotel, guests can enjoy access to a full-service spa and free breakfast, along with a private plunge pool. 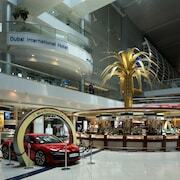 Other favorite sights in Dubai include Dubai Mall, Mall of the Emirates, and Ski Dubai. One of the top places to see outside the city is Sahara Centre, located 13 mi (21 from the heart of the city. 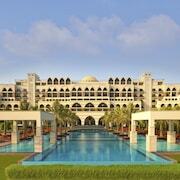 With so many transportation options, exploring Dubai is simple. Walk to nearby metro stations like Creek Station, Rashidiya Station, and Al Jadaf Station. You can explore options for water transportation at the marina. Explore Sydney with Expedia’s Travel Guides to find the best last minute hotels, cars, Dubai holidays and more!